A survivor of an abusive childhood, Kit Griffin cherishes her new life of freedom. But when her tyrannical mother is found brutally murdered on Mother’s Day, the horrors of her past threaten to destroy her. 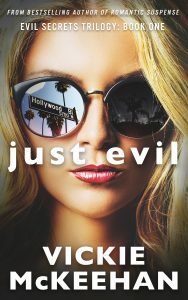 When she becomes the prime suspect, when the body count continues to rise, Kit must convince the police there’s a cold-blooded killer on the loose, a killer working his way down a mysterious list of victims all connected to her mother’s evil–a killer who has Kit Griffin squarely in his sights. Vickie’s novels have consistently appeared on Amazon’s Top 100 lists in Contemporary Romance, Romantic Suspense, and Mystery / Thriller. She writes what she loves to read — heartwarming romance laced with suspense, heart-pounding thrillers, and riveting mysteries. Vickie writes about compelling and down-to-earth characters in settings that stay with her readers long after they’ve finished her books. With twenty-three novels to her credit and numerous short stories, she has no plans to slow down. She’s looking at a busy 2018, adding a third installment to her new Coyote Wells Mystery series, releasing her eleventh book in the Pelican Pointe novels, and finishing the Sea of Bones in the Skye Cree books. If you belong to a book club, Vickie is available to chat with your members and always welcomes comments and emails from her readers.